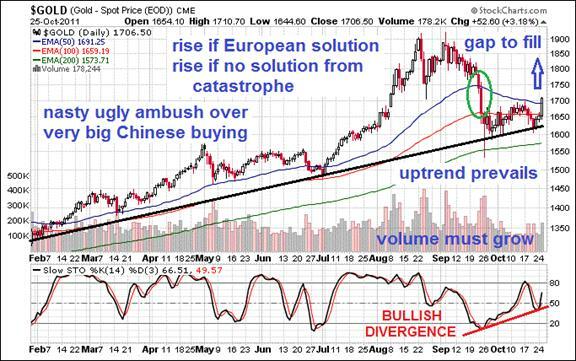 The feverish positive sentiment has left the Gold & Silver market in the last two months. Raised margin requirements during falling prices alongside naked short ambushes in the COMEX, coupled with permitted asset damage from debt monetization conducted more in secrecy will always help to dampen enthusiasm. But with the billboard message on the European subway walls and boulevards and news magazines stating the obvious, that the European debt crisis has no solution, that Germany has no more checks to write in funding the bailouts, that Greece is set to default, that leaders in political spheres are opposed by bank leaders where the final decisions are made, the GOLD & SILVER PRICES ARE SET TO ZOOM. Only the dummies sold in the last round of ambushes and interrupted recoveries. The precious metals have suddenly awakened. The old defended range for the two metals was easily overrun as a splash of reality hit the market faces. A mad scramble is likely from here onto the end of year, as people realize that hyper-inflation is the solution on any massive bailout with clearer gigantic needs, and as people realize that a broad string of bank failures will drive gigantic flows into safer places since sovereign bonds will go from sacred to toxic. The powerful decline in September, down $200 in gold and down $10 in silver suddenly have presented a ripe easy recovery without resistance. A powerful reversal is near and coming. Many investors will rush back in, paying higher prices than where they unwisely sold. Many investors will rush in, seeing banks and government bonds as ugly options. Before delving into the easy 15% upside opportunity in gold and easy 25% upside opportunity in silver, a topic begs to be covered. The topic is fraud. While discussion and analysis of fraud in US high finance can fill volumes, an entire set of encyclopedias, from just the last generation, direct attention to the fraud of investment funds and fraudulent bank accounting. My desire is to cite specifics on how investors have been duped into not participating in major moves up in commodity prices, like crude oil and precious metals gold & silver. My desire is to cite specifics on how the big banks avoid reporting 75% cuts in profits by fabricating the most absurd of accounting profits that even financial newscasters dispute as valid. The various funds to participate in the black gold and yellow gold asset plays have been congames. The defense by the big US banks against utter and complete insolvency have been congames. 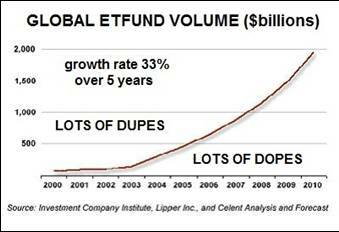 The public must avoid the ETFund investments. The public must avoid the perception that the big US banks are anything but dead. A opening argument against fraud and misrepresentation goes far beyond the Wall Street practice of pandering toxic bonds with AAA ratings. It goes far beyond promoting a fund that actually is critical in shorting oil and gold, rather than investing in them as investors intend. It goes far beyond deceiving about a price inflation between 7% and 11% since year 2005. It goes far beyond hiding an economic recession that started in 2007 and never ended. It goes far beyond news coverage of foreign wars like in Libya, when $90 billion in Qaddafi parked funds have been frozen, probably never to be released by Western banks. It goes far beyond $50 billion gone missing from the Iraq Reconstruction Fund with direct $2.3 billion payment handed to a fellow who received the highest medal of honor to a private citizen. The biggest problems that plague the United States Economy, its financial system, and its capitalist structure relate to ineffective usage of brainpower, co-opted assets & capital, and enormous investment in the corrupted system. Clearly the United States has untapped resources, deep riches, broadly spread. The nation has significant land, including agriculture, timber, and water resources. The nation has significant untouched oil & gas deposits, and natural energy in wind, sun, and geothermal pockets. The nation has significant knowledge and technology, some of which has never been used that could dramatically reduce a wide range of expenses. The nation has 300 million people who have a great deal of their time and energy ready for productive usage. The nation has enormous untapped resources. However, the investment and capital devoted to support the fraudulent system is staggering. Just look for instance at the CNBC and Bloomberg financial news center facilities. They are not devoted to industry that produces jobs directed at value added enterprise. Just look at the entire Wall Street and hedge fund and asset management sector. It is not directed at value added enterprise, but rather to shuffling of securities certificates. A Chinese economist remarked a year or more ago that of the $14 trillion US Gross Domestic Product, perhaps half was not legitimate since merely related to transfers of debt securities and other debt paper products. What a great point! The USEconomy might be exaggerated by double in legitimate size, a fact underscored by the industrial base that has been moved to Asia since 1980, first with the Pacific Rim and finally with the Chinese buildup. Just look at the vast network of consumption centers, like Wal-Mart and Target and Best Buy, the retail chains that do not invest in value added enterprise. Recall that 70% of the USEconomy is devoted to consumption, as some sort of sick religious exercise that all too often has resulted in home equity converted to things bought. America has spent its capital tragically and now finds its many sectors insolvent. The conclusion is that a large part of American capital is devoted to the syndicate and beholden to the advertisers. Resources do not mean much when the capital and brainpower is co-opted and dedicated to fraudulent enterprise and even to self-destruction. Let's consider some specifics. Larry Ellison of Oracle, Steve Jobs of Apple, and Bill Gates of Microsoft never finished college. They were productive, as Gates is given a pass for innovation in monopoly development and marketing theft to build a stodgy empire that has stagnated in the last decade happily. When young minds attend college, they emerge hungry to make a mark, to put a stake in the ground, to create an organization, to build wealth and to make a legacy. All too often, the best & brightest are hired by the bad guys. An entire generation of brilliant young minds has been largely co-opted. Microsoft took genius minds, as the Jackass knew of several who applied there. They produced co-opted software technology, source code theft during partnership ventures, little or no innovation unless one considers bundling to smother Netscape and Norton. Also Goldman Sachs took genius minds, as the Jackass knew none, but a couple wannabees. They produced insider trading in finance technology, derivative devices that enabled concealed debt, exchange traded funds that enable control of a market, and so much more. A Forbes Magazine editor once sat next to Gates on an airline flight. During the conversation, Gates admitted that his chief rival in hiring the best minds that America had to offer came from Goldman Sachs. So the best graduates pursue permitted monopoly and fraudulent finance. Also the Defense Contractors took genius minds, as the Jackass knows of one in particular. They specialize in weapon systems and the attendant equipment. The trickle down benefits are an illusion, as the end product is a structure in smithereens. Benefits trickle down in seven to ten stages. Destruction trickles down in two or three stages, with Senate kickbacks and cost overruns the chief icing. really dumb kids, whose perspective is both shallow and limited. When the Jackass was in Digital Equipment Corp from 1980 to 1993, many of us shook our heads when Intel, then many others, including DEC, opened manufacturing plants in the Pacific Rim. Ours were Taiwan, Hong Kong, and Singapore. One of my little accomplishments was to streamline online testing of factory output in quality control procedures. We had one major success with clients on their manufacturing sites that produced monitors and memory among others. The initial strategy on the national movement to off-shore was "just manufacturing" but many of us kept shaking our heads, thinking "no way, next comes Research & Development." Within only two years, the DEC site in Taiwan had a leading R&D center that ultimately developed a world class computer monitor, a smart monitor with loads of options. Patents were filed, and the business segments upstream were set to flourish. Capital was attracted to Asia by the boatload. The United States has huge resources. But as we have see in the last two decades, they have been tapped, and they will be tapped, but by foreign nations and foreign firms. For a disgusting sign of the times, look to the California high speed rail project. The California Legislature eventually had to install new laws to limit the contract funds and contract jobs going to China. Most stimulus aid foreign jobs. Even stimulus toward the infrastructure in a key project aided China more than the US. Sadly, most new jobs in the USEconomy are devoted to health care and retail. So we are becoming a nation of hospital orderlies and cash register clerks, whose products tend to be bedpans and checkout lines. No need for college on those fronts. Exchange Traded Funds are generally a profound fraud laced with deception and extremely slippery prospectus language. Many lazy investors are being duped. The flagship GLD fund is the worst perpetrator in my view. Many analysts and industry experts have offered details on all manner of problems, irregularities, and anomalies, like unstable bar lists, like shorted shares by management, like bullion metal inventory shipped to the COMEX, like vault fees without stored metal. Turn to the flagship crude oil fund. The popular crude oil ETFund has lost over half its value relative to tracking the commodity price. Funds might be regularly abused by managers to short the commodity and keep the price down, an old game with an easy fingerprints. Such practice would fly in the face of investors, who sometimes feel betrayed, when they discover what is happening under their desks. The investors think they are investing in gold or crude oil in a fund, but those in charge of management and fiduciary responsibility are working hard toward the opposite objective. Investors are duped into shorting the same assets they invested in, indirectly. The total volume of Exchange Traded Funds is fast approaching $2 trillion, but not well invested. The invested funds all too often support the system that wishes to keep down the commodity prices, so that paper financial products are encouraged. The GLD fund managed by HSBC receives the most attention on widespread illicit activity, from fraudulent drainage of its gold inventory toward the COMEX to meet delivery demands through massive shorting. The fund has never been subjected to the scrutiny of a full audit by an independent agency. Another big fraud is the crude oil investment tracker. The United States Oil Fund (USO) was introduced as a vehicle for investors to track the crude oil price. When it began, the ETF had a 1:1 price relationship with the New York crude oil from the futures exchange, a close match. Its expense ratio was a mere 0.45% in overhead. What a huge change since inception! The active month crude oil contract trades between $85 and $95, but the USO fund has been bobbing around recently in a lowly ratio to crude oil below 40%, with a plunge below 30% in October. The penalty for investing in the oil ETF has come to 60% to the dopey lazy investor. The investors did not invest in crude oil at all. They benefited not at all from any rise in crude oil over the last three years. Analysts defend the fund, claiming that rollover from current nearby contracts has eaten up value, along with administrative costs. That seems a lie. The successive monthly contracts do ramp down, but by the month's end, the difference should be very small. In all likelihood, just like GLD but to the extreme, the USO fund is being brutally abused to short the crude oil price on the West Texas contract. Recall that the WTIC oil price has consistently been $15 to $25 below the North Sea Brent oil price for months. Blame is placed for the gross differential on surplus storage at the Cushing Oklahoma facilities, but that too seems a lie. Look instead for a fishy finger on extreme Wall Street activity with futures contract shorts, perhaps even backed by the official Strategic Petroleum Reserve storage supply on oil slick cover. Notice in the ratio of USO/WTIC, the quantum decline in early 2009 corresponded to the extreme drop from $135 to $40 per barrel. Conclude that the USO fund might have been instrumental in generating some extreme profits on the downside when they drove down the crude oil price. Even more leverage is deployed with futures options. One can see the other smaller quantum declines circled on the graph. Even they are outsized, since 6% is not the cost to roll into the current nearby month. The spread from successive months is typically only 30 to 60 cents, well under 1%. See for yourself from the INO website on the CL crude oil futures contract (CLICK HERE). However, between those sudden drops one can notice a steady ramp in decline. That is where the fraud and abuse lies, since they should be flat horizontal, acting like a true tracking fund. There is no tracking. Funds are in high likelihood removed regularly in illicit shorting programs, to sell the crude oil contract with investor funds. Just speculating, but this is an old game. A final comment on the lavish expense ratios. For the SPDR Gold Shares (GLD) it is 0.40%, which does not seem like much. However, the size of the fund is about $55 billion, making 0.40% a hefty $220 million. That is a big fee to charge for mismanagement. At best it is bad investment decisions, but at worst it is fraud such as from shorting the shares, the money drawn out to sell into the gold market. The metal inventory from short programs would go straight to the COMEX, as some intrepid reporters have revealed from insider sources. Conclude that investors are violated coming and going. Only total idiots and morons invest in such funds, of course along with lazy folks, cheered on by intellectual clowns like Adam Hamilton of Zeal Intelligence, who seems never to have identified a fraud in his entire career. Let me introduce you to my little friend, said the infamous Scarface. The little friend for the giant US banks is the Debt Value Adjustment, which fabricates profits from bond decay. The success is in placating really stupid investors, who rush in, only to see the bank stock fall by the afternoon sesssion. The accounting fraud committed by JPMorgan is typical. Instead of taking a loss on their own declining corporate bonds, or doing nothing, they posted a queer profit in a Debt Value Adjustment of $1.9 billion, equal to 29 cents per share. The JPM bond yield spread has widened by 200 basis points versus the USTreasury Bond. The bank colossus paid out $1 billion in legal expenses for bond investor lawsuits. They raided $96 million from Loan Loss Reserves, which will be needed later, like in bond fraud investor settlements. They cut 1100 in bank staff. They posted a $700 million decline in investment banking profit. Their biggest line item of profit was the fiction of a $1.9 billion profit from their decaying corporate bonds. It is not a profit & loss event at all. If they default on the corporate bond, imagine the accounting profit could be maximized. Only in American bank accounting!! Blessed as good by the FASB and USCongress!! JPMorgan is a wreck, as their businesses are tanking. Their tight grip on the Silver market could be loosened in time. Profits announced by the big US banks are phony. A laundry list of tainted supposed profits came in the last two weeks for the entire crew of giant insolvent us banks. The Debt Value Adjustment (DVA) deception is the main common thread of deception. Citigroup posted $1.9 billion in Debt Value Adjustments, the same amount JPMorgan posted for DVA in a parade. This item is so corrupt as to be indefensible by any rational person. They take the fallen value of their own corporate debt, cite how they could buy it back at a lower cost, and book the difference as profit. But the debt is not bought back, only pretended. Similar games are played with bond spreads widening, but keep the argument simple. Imagine a corporate bond rising in principal, but not as fast as USTBonds, booked as a profit since the spread has worsened. So if the corporate bond fails altogether and goes to zero, the DVA would maximize the profit for the dead firm. In my book, dead firms do not buy back their debt. As a statistical analyst, the Jackass always prefers to carry an argument or method to the extreme to reveal its legitimacy or flaw. Bank of America also posted a $1.7 billion DVA profit, but the winner was Morgan Stanley, which has the highest risk of death. They posted a hefty $3.4 billion fictional profit from a non-event adjustment to their corporate debt, the same Debt Value Adjustment. Without such tainted profits, the big US banks would have shown their dead decaying matter more clearly. Worse, during a time when mortgage assets and lawsuits are all the rage, they raided their Loan Loss Reserves, more phony profits. Bank of America even listed litigation losses while raiding LLReserves in the amount of $1.6 billion. Citigroup snatched back $1.4 billion in LLR, while Wells Fargo snatched back $0.8 billion in LLR. The big US bank quarterly reports were worse than dreadful, as they were corrupted and phony, the rot visible. Amazingly, the Bloomberg financial news identified the practice as questionable but legal, calling them poor quality profits!! Poor quality indeed. They are too kind. In March they called outgoing Egyptian leader (emperor) Mubarek a prolific saver, for having accumulated $60 billion. Maybe they will call the pilfered Libyan funds sticky, when not returned. Bank of America dumped its derivative book, possibly preparing for a restructure. The dumping ground is likely a pitstop en route to the USGovt toxic vats. The USFed applauds while the FDIC complains. Raids of assets preceded the Lehman Brothers failure, alert students of history note. This event might be no different. Bank of America engaged in devious accounting. Not only did they call their own corporate bond decay a phony profit, but the firm shifted much of its mountain of derivatives held on its balance sheet as of June 30th. They moved it to their retail bank. Just last week, Moodys downgraded the bank holding company from A2 to Baa1. The retail bank was downgraded more gently to A2 from Aa3. The collateral backstopping will next be done fully and effectively by the bank's $1.041 trillion in deposits. A bank run has been rumored at the big lumbering insolvent bank. Its website was down for several consecutive days, inhibiting usage of funds. Furthermore, the insurance agency to the depository base is very angry, namely the Federal Deposit Insurance Corp. The FDIC is another dead entity, devoid of funds, posing as a Wall Street harlot, this time betrayed by its brethren. The USFed favored the shift on the books, so as to give relief to the bank holding company (in their words). Conclude that depositors are forced to backstop its $53 trillion derivative book, as clients continue to depart. Savings accounts and certificate holders might be wiped out on a liquidation. Bank of America already had the threat of failure looming due to deep insolvency from mortgage and litigation losses. Until now, the operations like the retail banks would not be affected and could be spun out to a new entity, even sold. Shareholders would be wiped out and holding company creditors like the bondholders would take losses. The derivative shift changed everything. Bank analyst Chris Whalen calls it either criminal incompetence or abject corruption by the USFed. Dumping derivatives into the depository business segment goes in diametric opposition to Dodd Frank resolutions. So much for Financial Regulatory Reform if not enforced. The US Federal Reserve and Federal Deposit Insurance Corp are in deep disagreement over the transfers. The USFed favors moving the derivatives to benefit the bank holding company, while the FDIC objects since it must pay off depositors in the event of a bank failure made more likely. The FDIC will attempt to reject this brazen move. The corrupted USFed will argue not to disrupt the financial markets further. Witness the justification for a Dodd Frank resolution and ruling. The 2005 bankruptcy law was revised to permit derivatives counter-parties to be given the first in line position. They grab assets first in a little known feature of the bankruptcy reform that favored the banks. This truly devious bold move amounts to a direct transfer from Merrill Lynch derivatives risk to the USGovt via the FDIC. It means depositors will be made whole only after derivatives counter-parties have seized collateral. Depositors are lined up for a legalized raid, better yet a theft. Recall back in September 2008, that Lehman Brothers failed over a weekend after JPMorgan grabbed its collateral in a basic daylight raid. Expect another TARP type of bank bailout, as the Wall Street firms jockey to slide their derivative exposure under carefully crafted shells. The bad news for them is that they have over $200 trillion left, even after this ugly maneuver to shift the Merrill Lynch exposure. Finally, attention has grown on the gathering storm of Italy. Their debt is being downgraded steadily, just like Spain. The Italian prime minister seems like a clown in a suit, calling the crisis a fiction written by the press. They reject austerity measures, as their debt runs out of control. The nation of Italy must fund over EUR 200 billion of debt before the end of 2012, from rollover. Their bond yield has surpassed the 6.0% level known to serve as the alarm bell. Then tack on fresh debt. The Greek domino could easily push over the Italian domino, which lies next to the fragile Spanish domino. The European Monetary Union will break. Germany announced the return of the Deustche Mark, the date unclear for re-launch. It will be priced for conversion at one Euro to 1.95 DMarks, the same as the 1999 exchange rate when the ill-fated Euro was born. Regard this vehicle as a transitional currency to a new gold-backed currency, the USDollar Killer, the ticket to the Third World. Details are in the October Gold & Currency Hat Trick Letter report. These are exciting times, but dangerous times, full of risk, but full of opportunities.